The Investec UK Alpha Fund aims to provide attractive long-term returns. A core UK equity fund, it seeks outperformance of 3-5% per annum above the FTSE All-Share Index*. The Investec UK Alpha Fund aims to provide attractive long-term returns. The Fund seeks outperformance of 3–5% per annum above the FTSE All-Share Index*. A high conviction portfolio of 50-90 stocks, diversified by sector and market-cap with at least 50% exposure to FTSE 100 and maximum of 10% to small caps†. Alpha is driven by bottom-up stock selection with a focus on attractively valued, quality businesses with strong financials and management. Managed by Simon Brazier and backed by an experienced and well-resourced investment team, with a successful long-term track record^. *Performance targets are subject to change and may not necessarily be achieved, losses may be made. Calendar (and Index***) year returns: 2018: -9.6(-9.5%); 2017: 12.8%(13.1%); 2016: 9.1%(16.8%); 2015: 6.4%(1.0%); 2014: 6.7%(1.2%). Source: Morningstar, 31.12.18. ^^Inception date of Fund 31.12.01. On 12.01.15, the investment team of the Fund changed from 4Factor to Quality. From October 2016 end of day prices have beenused in order to align the Fund’s valuation point with that of the comparative index. Performance shown on other marketing materials may reflect the fund’s mid-day valuation and so may differ. Quartile ranking within the IA All Companies sector, shown for I Inc, on midday pricing. Calendar year performance source: Morningstar, 5 years ending December 2017. **Performance is net of fees (I Share class, NAV based, including ongoing charges, excluding initial charges), gross income reinvested, in GBP. ***Index: FTSE ALL-Share. A Company Valuation Framework is at the core of the investment team’s research process. 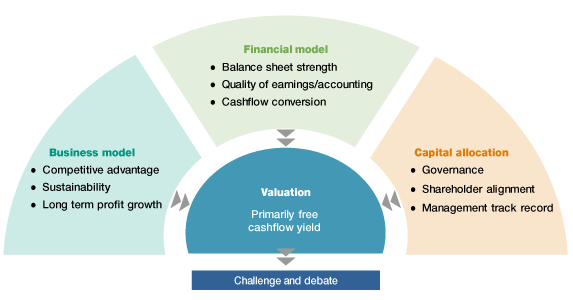 Success is based on the strength of three key factors – business model, financial model, and efficient capital allocation – ultimately however, valuation is key. When constructing the portfolio, business risk is a key driver of position size. Companies with higher business risk will typically have lower weightings to minimise downside potential. Morningstar Analyst Rating awarded in June 2018. *Gross of fees over rolling 3 years. This is an aim and not a guarantee. †These are internal parameters and subject to change without prior notification. ^Simon Brazier became the portfolio manager on 12.01.15.